If you want a quick getaway this December, you can go to Las Vegas and stay at the Vdara* in a suite for less than $95 a night, or a 1 Bedroom Penthouse Suite for less than $277 a night. A $28 resort fee and 12 % tax are not included, but a $50 daily spa credit is included, so no matter how you do the math, this works out to a good deal for a stay at a AAA Four Diamond Resort. Ahhh I hear you all checking airfares and your mileage as you try to figure out how to get to Las Vegas….how about trying the new Megabus? They have an inaugural fare of $1 each way, yes, you read that correctly ONE DOLLAR between December 12-19 on trips from Los Angeles to Las Vegas or San Francisco! These are the huge climate controlled, WiFi behemoths which have bathrooms, reclining seats, and outlets. The only “hidden fee” is a $.50 (yes, FIFTY CENT) per transaction booking fee. As in all great deals, these won’t last long, so book them now if you want them! *Please note that this resort is nonsmoking and there is no gaming, so if you are looking for a casino/hotel, I would suggest another hotel like the Bellagio next door or the Wynn further down the strip. Sometimes I feel like Goldilocks tasting food across the city; some dishes are bad, some are just bland, and I keep searching for ones that are just right, hoping to find the best ones. Unlike the notoriously bad review by the New York Times of American Kitchen and Bar, I do my best to post something likeable or hopeful about every place I go, unless something happens so beyond good taste or good manners that I remove a review, which has only happened once (for exceedingly bad manners). So with all this being said, I will begin with the bad. Jinya Ramen recently opened on Sawtelle and I was looking forward to good broth to rival the excellent Tsujitawhich has lines around the block for a table. Unfortunately when their own press release says the broth is “pumped up with industrial quantities of dashi and dried fish” it means INDUSTRIAL, which a is distinctly different than QUALITY. As a franchise, I did not expect much, but I was appalled to see them using a MICROWAVE to heat up some ingredients! The spicy pork miso I ordered was presented beautifully, but after a few spoonfuls, I could not eat this exceedingly sweet slightly foul smelling soup. Later that night I had an upset stomach and I woke up with the horrible consequence of having eaten an industrially produced soup stock. 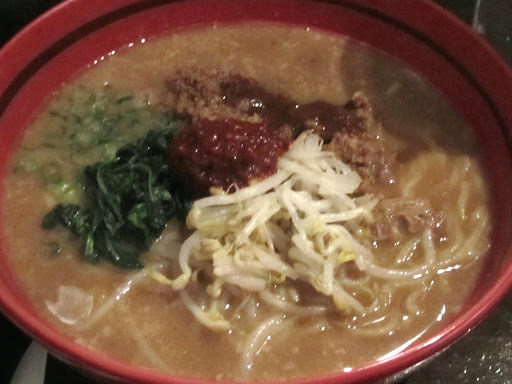 It is well worth the wait to eat at Tsujita. After that experience I had to go get a bowl of something good to put into my system, so I headed over to Urth Cafefor their marvelous vegetarian chili. 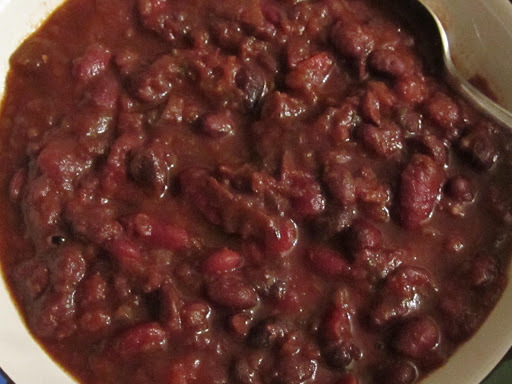 It is on their menu everyday and my favorite vegetarian chili (besides the one I make myself). The quality of the ingredients and the blend of perfect spices, make this a filling and savory bowl of comfort food for any cold or rainy day. 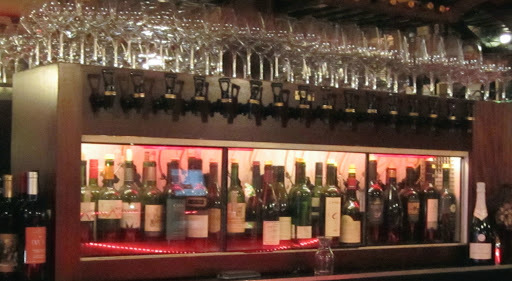 After trying something new and something old, I wanted to try something different, so I went to Vino and Tapas in the Valley before a movie screening in the area. 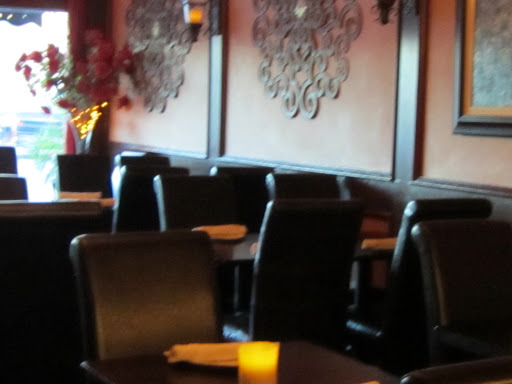 They have a Happy Hourfrom 4-7pm with drinks ranging from $4-7 and tapas for only $5. Since they open at 4pm the place was empty, but that was fine with me since that meant I could get in and out before my movie with ease. I ordered a Kaiken 2009 Malbec which was quite nice, but ended with the much nicer DeLoach Pinot Noir, both $6 each during Happy Hour and served in the perfect glassware for the varietal! 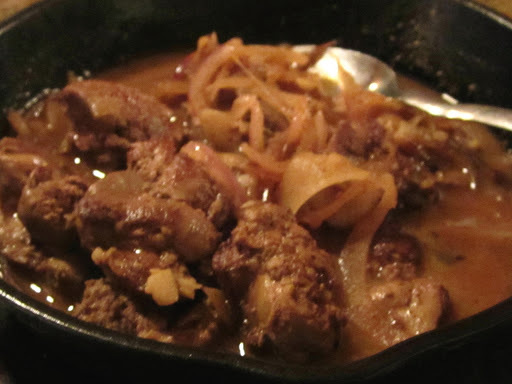 I hardly ever see chicken livers on any menu, so I had to order them. They were a bit overcooked and a bit bland, so I asked for some salt, but even adding seasoning could not save this dish. 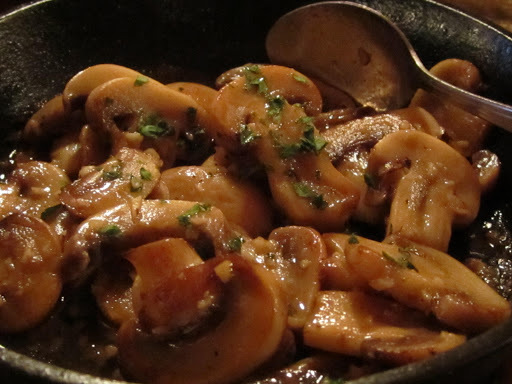 I also ordered some mushrooms with garlic, herbs and a Chardonnay sauce which were so delectable that I ate the sauce with slices of bread to soak up every last bite! 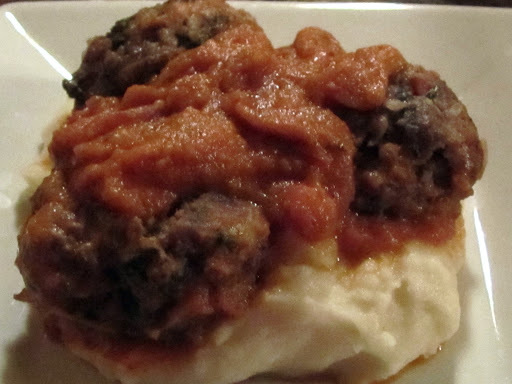 To get rid of the taste of the chicken livers, I ordered the meatballs in tomato sauce which had a nice basil flavor and decent tomato sauce. It was not an outstanding dish, but it was executed well and a nice rendition of the classic. 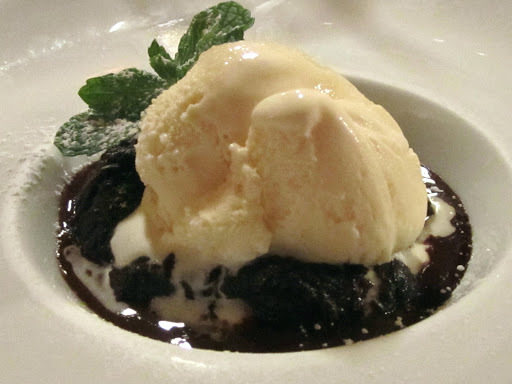 It was wonderful to end on the excellent flourless chocolate cake dessert for $8 with vanilla ice cream and a chocolate sauce. It is a very rare event when I finish a dessert and I finished this one! I am very grateful to have a happy sweet ending to this week before Thanksgiving, and I am very grateful for all of you who read my blog and for all that I am able to share with you! I’m not one of those people who camp out for a special on Black Friday, but I do appreciate a great one day deal. The Surf & Sand in Laguna Beach is one of my favorite hotels, with wonderful food, spectacular views, and within walking distance to Forest Avenue (the main thoroughfare). The rooms normally go for about $400 a night during low season and as much as double that in the Summer, so if you add on the resort fee and parking, you are looking at a premium price for a premium resort. I appreciate quality, but when you can get quality at a discount, that is literally the best of both worlds. If you set your alarm clock to call 866.860.6154 or book online on November 23, 2012 between 7am and 7pm, you can book a one night stay for as little as $219 Sunday-Thursday or $299 Friday and Saturday. You must go by January 31, 2013, but you also get complimentary resort fee and parking for this rate! The best part is that if you can’t get through, they are offering the same deal on Cyber Monday but only online! Get set, ready, dial (or type)! 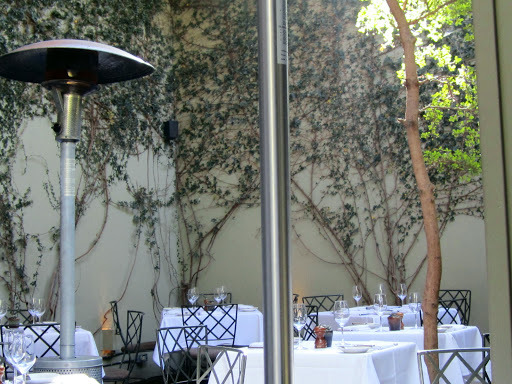 Lucques was last restaurant at the intersection of La Cienega and Melrose that I had not yet tried. I can now say that I have eaten in every one with a smile:) Comme Ca, Taste, and Fig & Olive are all very good, with menus and atmospheres that range from casual (Taste) to hip (Fig & Olive) with a bit of flair thrown in (Comme Ca) for good measure. Ago is the only one I would avoid completely in this mecca for good food. 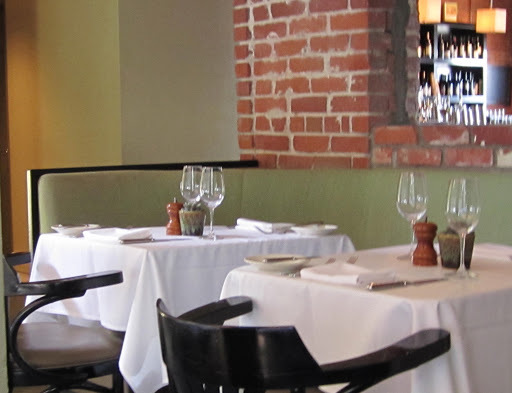 Lucques has been around since 1998, and the only reason I haven’t been here is because Tavern (also created by Suzanne Goin with her business partner Carolyne Styne) is closer to home, and traffic dictates how far I am willing to travel in Los Angeles! Sometimes it is good to venture out a bit from my neighborhood, and since West Hollywood isn’t that far away during midday traffic, I decided to brave the drive and I am very happy I did. The space is welcoming both inside and out. Since it was one of those beautiful 80 degree days we get in Southern California in November, I sat outside in the covered patio. The walls of climbing ivy made this space much more inviting than the indoor tables on a balmy afternoon. The bread and this small plate of amuse bouche made me smile with delight. 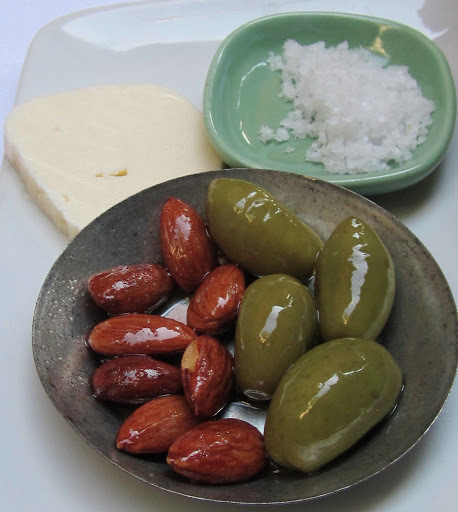 The small plate of kosher salt and butter harkens to the Tavern presentation, but the olives and almonds were a nice variation and I am glad I saved room for my meal because I could have easily made a meal of bread, olives and almonds. My waiter came by to inform me that the market fish today was Salmon, and when he saw the disappointed look on my face, he quickly offered to see if he could substitute another fish for me. 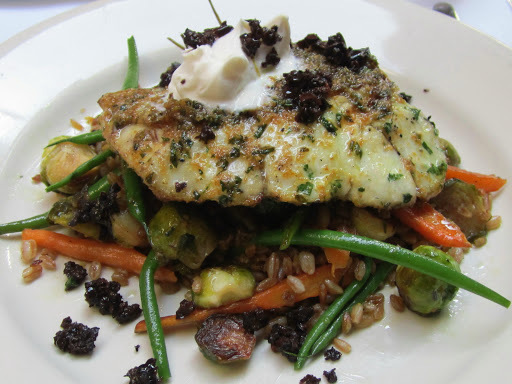 The substitute fish he offered was a Barramundi (one of my favorites), and it was served with farro, caramelized brussel sprouts, baby carrots and haricots verts so fresh they could have been green candy! A nice tapenade and sour cream accent made this Barramundi a perfect lunch for $25. They have a variety of wonderful wines by the glass from $8-$30, and I chose an Entre Deux Mers at $12 to compliment this tender white fish. The plate was quite large, but I did manage to finish nearly every grain of farro. I wish I had saved some room for dessert because the woman at the next table loved her coupe so much she ordered TWO!